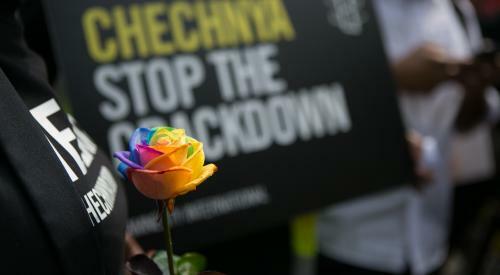 It’s been a year since the horrifying news emerged of gay and bi men being rounded up by authorities in Chechnya and detained in unofficial prisons, tortured and killed. One year on and no one has been held to account for these crimes and the crisis continues. Hundreds of LGBT people have been affected. Survivors’ reports allege beatings, torture and victims being forcibly disappeared at the hands of the Chechen authorities – their fate unknown. Fearing for their safety, LGBT people at risk continue to flee the region, with the support of the Russian LGBT Network. The network has successfully managed to evacuate over 119 LGBT people out of Chechnya and the surrounding region, 98 who have been offered sanctuary outside of Russia. More survivors are in desperate need of sanctuary and countries like the UK and others should step up and provide this. So many of us spoke out when the news first broke and the Russian authorities responded by opening an investigation into these crimes. Yet, despite continued pressure and clear evidence - including a survivor bravely coming forward to publicly recount his horrifying ordeal - no proper investigations have taken place. We continue to stand in solidarity with LGBT people in Chechnya and call on the Russian authorities to immediately investigate these crimes and hold the perpetrators to account.